Doç. 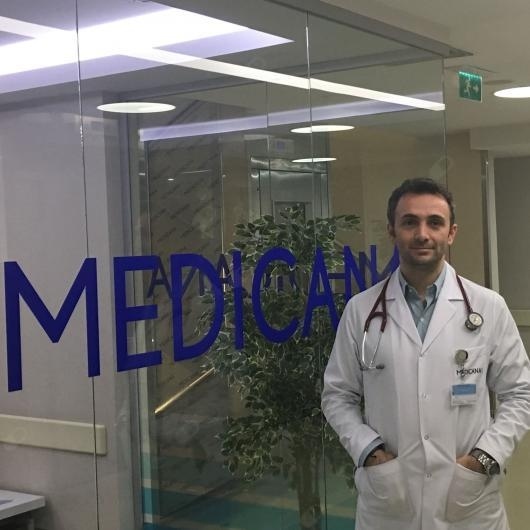 Dr. Murat Yalçın, Medicana Çamlıca Hastanesinde hizmet vermektedir. Işılak Z, Küçük U, Uz O, Yalçın M, Temizkan V. Multimodality Images of a Mixed Atrial Septal Defect. Arq Bras Cardiol. 2016 Feb;106(2):160-1. doi:10.5935/abc.20160016. English, Portuguese. PubMed PMID: 26934024; PubMed Central PMCID: PMC4765016. Yalçin M, Isilak Z, Atalay M, Incedayi M. Symptomatic giant cardiac cyst hydatid in an adult woman. BMJ Case Rep. 2013 Mar 21;2013. pii: bcr2013009148. doi: 10.1136/bcr PubMed PMID: 23524347. Incedayi M, Isilak Z, Ozturk E, Yalçin M. Coronary CT angiography and stress perfusion scan for evaluation of patients with atypical chest pain. BMJ Case Rep. 2013 Mar 19;2013. pii: bcr2013008570. doi: 10.1136/bcr PubMed PMID: 23514807. Isilak Z, Deveci OS, Yalçin M, Incedayi M. An unusual case of infective endocarditis: annulus vegetation. BMJ Case Rep. 2013 Jan 14;2013. pii:bcr2012008089. doi: 10.1136/bcr PubMed PMID: 23322308. Işılak Z, Tokatlı A, Yalçın M, Uzun M. Case images: A very rare case: Ebstein anomaly, biventricular noncompaction and pre-excitation in the same patient. Turk Kardiyol Dern Ars. 2012 Oct;40(6):557. doi: 10.5543/tkda PubMed PMID: 23363907. Isilak Z, Deveci OS, Yalçin M, Incedayi M. An adult patient with ruptured sinus of Valsalva aneurysm to the right ventricle. BMJ Case Rep. 2013 Jan 30;2013. pii: bcr2012008184. doi: 10.1136/bcr PubMed PMID: 23370955. O. Kozan, E.E. Ozcan, O. Sancaktar, G. Kabakcı; Turkish investigators of the i-SEARCH study. The prevalence of microalbuminuria and relevant cardiovascular risk factors in Turkish hypertensive patients. Turk Kardiyol Dern Ars. 2011 Dec;39(8):635-45. doi: 10.5543/tkda . Yalcin M, Kardesoglu E, Isilak Z, Uz O, Atalay M, Tezcan M, Uzun M, Sikti Cebeci B. The association between plasma uric acid level and cardiovascular events in patients with stable coronary artery disease: a short-term follow-up study. Med Glas (Zenica). 2013 Aug;10(2):239-43. PubMed PMID: 23892838. Aparci M, Isilak Z, Uz O, Yalcin M, Kucuk U. Endocan and endothelial dysfunction. Angiology. 2015 May;66(5):488-9. doi: 10.1177 . Epub 2015 Jan 27. PubMed PMID: 25632053. Yalcin M, Aparci M, Isilak Z, G Senol M. Atrial fibrillation and novel echocardiographic evidence for anticoagulation in cardioembolic stroke. Eur J Neurol. 2016 Mar;23(3):e11. doi: 10.1111/ene.12968. PubMed PMID: 26918746. Kardesoglu E, Aparci M, Yalcin M, Isilak Z. Retrograde Percutaneous Coronary Intervention for Chronic Total Occlusion: Sine Qua Non of Success. Angiology. 2016 May;67(5):497-8. doi: 10.1177 . Epub 2016 Feb 16. PubMed PMID: 26882926. Kucuk U, Kucuk HO, Uz O, Yalcin M, Isilak Z. Second versus first generation drug eluting stents during stent overexpansion. Eur Rev Med Pharmacol Sci. 2015 Dec;19(23):4456. PubMed PMID: 26698237. Aparci M, Yalcin M, Isilak Z. Accumulation of Ca+2 at arterial segments proximal to myocardial bridging may influence the vascular dynamics of coronary artery. Int J Cardiol. 2016 Jan 1;202:782-3. doi: 10.1016/j.ijcard Epub 2015 Oct 9. PubMed PMID: 26474469. Isilak Z, Eroglu M, Uz Ö, Yalcin M. Cardiac Ultrasound: Power in the Hands of Emergency Physicians. Acad Emerg Med. 2015 Nov;22(11):1358. doi:10.1111/acem.12808. Epub 2015 Oct 15. PubMed PMID: 26469288. Yalcin M, Isilak Z, Bicakci B, Uz O. Risk factors of pocket hematoma in patients with electrophysiological device implantation. Eur Rev Med Pharmacol Sci. 2015 Sep;19(17):3135-6. PubMed PMID: 26400510. Aparci M, Isilak Z, Kendirli MT, Yalcin M. Are Right to Left Shunts Underdiagnosed in the Etiology of Migraine Headache? Headache. 2015 Oct;55(9):1268-9. doi: 10.1111/head.12692. Epub 2015 Sep 18. PubMed PMID: 26382571. Yalcin M, Uz O, Eroglu M, Isilak Z, Kucuk U. Effect of obesity in electrocardiographic criteria: is that important? Am J Emerg Med. 2015 Nov;33(11):1707-8. doi: 10.1016/j.ajem Epub 2015 Aug 17. PubMed PMID: 26361867. Yalcin M, Isilak Z, Uz O, Kucuk U. Left atrial appendage morphology and thromboembolic risk in atrial fibrillation. Eur Rev Med Pharmacol Sci. 2015 Jun;19(12):2143. PubMed PMID: 26166633. Atalay M, Tezcan M, Yalcin M, Degirmencioglu G, Kardesoglu E. Support or not to support the left ventricle in patients with acute myocardial infarction complicated by cardiogenic shock? Chin Med J (Engl). 2013;126(24):4815. PubMed PMID: 24342343. Yalçin M, Atalay M, Isilak Z, Uz O, Kardesoglu E. Transradial access should be preferred in all patients with acute coronary syndrome? The game is not yet over. Chin Med J (Engl). 2013 Jul;126(14):2800. PubMed PMID: 23876922. Atalay M, Tezcan M, Yalcin M, Isilak Z, Kardesoglu E. Still unsettled issue: antiplatelet therapy after stenting in patients taking oral anticoagulants. Chin Med J (Engl). 2013 Nov;126(22):4397. PubMed PMID: 24238538. E Kardesoglu, M. Yalcin, Z. Isilak, O. Uz, M. Atalay. Inhibition of vascular smooth muscle cell proliferation: an indispensable target in treatment. Chin Med J (Engl). 2012 Oct;125(19):3600. E. Kardesoglu, M. Yalcin, Z. Isilak, O. Uz, M. Atalay. Cardioprotection with adenosine in patients with ST-segment elevetaion myocardial infarction. Chin Med J (Engl). 2012 Sep;125(18):3343. Kara K, Öztürk E, Yalçın M, Yüksel C, Sıldıroğlu O. Giant coronary sinus of Valsalva aneurysm. Anatol J Cardiol. 2015 May 22;15(6):E18-9. doi:10.5152/akd.2015.6327. PubMed PMID: 26006149. Tezcan M, Aribal S, Uz O, Yalcin M, Kardesoglu E. A case of congenital complete absence of the pericardium. Kardiol Pol. 2015;73(1):54. doi:10.5603/KP.2015.0002. PubMed PMID: 25762058. Isilak Z, Incedayi M, Aribal S, Saglam M, Yalcin M. Coexistence of left ventricular noncompaction and aortic interruption. Echocardiography. 2013Aug;30(7):E220-1. doi: 10.1111/echo.12225. Epub 2013 May 31. PubMed PMID:23724972. Isilak Z, Deveci OS, Yalcin M, Uzun M. An adult patient with patent ductus arteriosus: multimodality diagnostic approach. Kardiol Pol. 2013;71(6):660. doi: 10.5603/KP.2013.0141. PubMed PMID: 23797450. Yalçın M, Eroglu M, Isilak Z, Aparci M, Cebeci BS. Acute respiratory failure due to giant aortic aneurysm mimicking massive pulmonary embolism in a patient with Marfan's syndrome. Kardiol Pol. 2013;71(11):1212. doi: 10.5603/KP.2013.0312. PubMed PMID: 24297729. Yalçın M, Atalay M, Işılak Z, Sağlam M, Kardeşoğlu E. Heterotaxy syndrome associated with left ventricular non-compaction. Anadolu Kardiyol Derg. 2014Feb;14(1):E1. doi: 10.5152/akd.2013.4987. Epub 2013 Dec 18. PubMed PMID: 24382505. Yalçin M, Atalay M, Işilak Z, Oztürk E. Hypertrophic cardiomyopathy associated with abnormal origin of right coronary artery. Kardiol Pol. 2014;72(4):385. doi: 10.5603/KP.2014.0074. PubMed PMID: 24733701. M. Eroğlu, M. Yalcin, Z. Isilak, M. Velioglu. A deadly chain of events in a case; Deep venous thrombosis, pulmoner embolism, patent foramen ovale and cerebral embolism. Anadolu Kardiyoloji Dergisi, 2013 May;13(3):289-90. doi: 10.5152/akd.2013.088. Z. Isilak, M. Uzun, M. Yalcin, F. Kılıcaslan. An adult patient with ruptured posterior mitral valve aneurysm, Anadolu Kardiyoloji Dergisi, 2013 Aug 5;13(5):E25. doi: 10.5152/akd.2013. Z. Isilak, O.S. Deveci, M. Yalcin, M. Incedayı. Coexistence of Accessory Mitral Papillary Muscle and Ventricular Septal Defect, Anadolu Kardiyoloji Dergisi, 2013 May 10;13(3):E15-6. doi: 10.5152/akd.2013.092. Z.Isilak, M. Yalcin, A. Tokatlı, M. Uzun. Giant Septal Hypertrophic Cardiomyopathy, Anadolu Kardiyoloji Dergisi, 2013 Jun 7;13(4):E21. doi: 10.5152/akd.2013. Z. Isilak, M. Yalcin, A. Tokatlı, M. Uzun. Accordion like giant interatrial septal aneurysm Anadolu Kardiyoloji Dergisi, 2013 Feb;13(1):E3-4. M. Yalçın, Z. Işılak, O. Uz, M. Doğan. Giant J-wave (Osborn wave) related to hypothermia and hypokalemia. Anadolu Kardiyol Derg. 2012 Sep 18. doi: 10.5152/akd.2012.229. Z. Işılak, M. Yalçın, M. Incedayı, S. Cay. Persistent left superior vena cava associated with giant coronary sinus. Anadolu Kardiyol Derg. 2012 Aug 8. doi: 10.5152/akd.2012.209. Z. Isilak, O.S. Deveci, M. Yalcın, O. Uz, M. Dogan, M. Uzun.A unique case of parachute mitral valve in an adult: an abnormally long chorda tendinea. Echocardiography. 2012 Oct;29(9):E245-6. Çelik A, Özçetin M, Ateş Ö, Altunkaş F, Karaman K, Akar İ, İnce İ, Yalçın M, Karayakalı M, Ceyhan K, Koç F. Analyses of C-Reactive Protein, Endothelial Nitric Oxide Synthase and Interleukin-6 Gene Polymorphisms in Adolescents with a Family History of Premature Coronary Artery Disease: A Pilot Study. Balkan Med J. 2015 Oct;32(4):397-402. doi: 10.5152/balkanmedj Epub 2015 Oct 1. PubMed PMID: 26740900; PubMed Central PMCID: PMC4692340. Yalcin M, Yiğiner O, Eroğlu M, Sehirli O, Berber U, Ozçelik F, Sener G. Effect of hyperbaric oxygen treatment in a rat model of abdominal aortic aneurysm. Undersea Hyperb Med. 2014 Jan-Feb;41(1):915. PubMed PMID: 24649712. Eroglu M, Uz O, Isilak Z, Yalcin M, Yildirim AO, Kardesoglu E. Carbon monoxide poisoning increases Tpeak-Tend dispersion and QTc dispersion. Cardiovasc J Afr. 2014 May-Jun;25(3):106-9. doi: DOI: 10.5830/CVJ1-2014-012. PubMed PMID: 25000439; PubMed Central PMCID: PMC4120128. Uz O, Atalay M, Doğan M, Isilak Z, Yalcin M, Uzun M, Kardesoglu E, Cebeci BS. The CHA2DS2-VASc score as a predictor of left atrial thrombus in patients with non-valvular atrial fibrillation. Med Princ Pract. 2014;23(3):234-8. doi: . Epub 2014 Apr 16. PubMed PMID: 24751402. Aparci M, Erdal M, Isilak Z, Yalcin M, Uz O, Arslan Z, Kardesoglu E. Enlargement of the aorta: An occupational disease? Exp Clin Cardiol. 2013 Spring;18(2):93-7. PubMed PMID: 23940428; PubMed Central PMCID: PMC3718583. Yalcin M, Aparci M, Uz O, Isilak Z, Balta S, Dogan M, Kardesoglu E, Uzun M. Neutrophil-Lymphocyte Ratio May Predict Left Atrial Thrombus in Patients With Nonvalvular Atrial Fibrillation. Clin Appl Thromb Hemost. 2013 Sep 19. [Epub ahead of print] PubMed PMID: 24057399. Z.Isilak, E. Kardesoglu, M. Aparci, O. Uz, M. Yalcin, O. Yiginer, B.Y. Cingozbay, M. Uzun. Comparison of clinical risk assessment systems in predicting three-vessel coronary artery disease and angiographic culprit lesion in patients with non-ST segment elevated myocardial infarction/unstable angina pectoris. Kardiol Pol. 2012;70(3):242-50.